"Sycamore," a string-quilt sampler is displayed in the home of Angie Ott, the daughter of its creator, Agnes Adams Adkison. Mrs. Adkison first learned about string quilts during the Great Depression. With names ranging from "Hillbilly Star" to "Snake in the Rocks," string-pieced quilts are making a resurgence in sewing circles. Agnes Adams Adkison, 86, knows what she's talking about when it comes to this unique quilt-making style. She's been making string-pieced quilts for nearly 80 years and teaching how to make them for 40 years. "String-pieced quilts show the dignity of making something special out of absolutely nothing," she smiled. And what does the Cannon County native mean? Most quilts are fashioned from big, patterned blocks of material pieced together. String-pieced quilts are made from tiny pieces of cloth which are remnants of a larger sewing project. This process had its first heyday back during the Great Depression when most clothing was hand-made by a mother or grandmother. "Every scrap was important. Every little scrap was saved," Mrs. Adkison said. That was particularly true with a large family like the Adams who had nine children. "Clothes would go through three children before they were not wearable." When the seamstress of the house would make a shirt or dress for one of the youngsters, there was probably a tiny sliver of material left from sewing a seam. Instead of tossing it away, that scrap was carefully saved as were sections of string. That string might even come from a flour sack. Those left-overs were assembled into quilts. "Everyone made quilts," she said. Grandmothers, mothers and daughters all worked on their projects during what little time was available. During the midst of the Great Depression, the Adams (Dr. J.F. and Laura Elizabeth) family took on a special project for the little town of Woodbury. "In 1932, our family decided to build a hospital. Father asked Mother how many how many men she could provide three meals a day," Mrs. Adkison said. After much consideration, Mrs. Adams decided she could feed 35 workers. The Adams family then took out an advertisement in the Cannon Courier looking for workers to build the hospital. Once the roof was up, beds were readied for the workers. "We had to make quilts. I had a terrible stutter and people couldn't understand me so Mother kept me close to her side," Mrs. Adkison said. "I stood in front of Mother working the treadle of the sewing machine." Working together, they made quilts for all 35 workers. Speed was of the essence. "I have one of them left. It may be the ugliest quilt ever," she laughed. 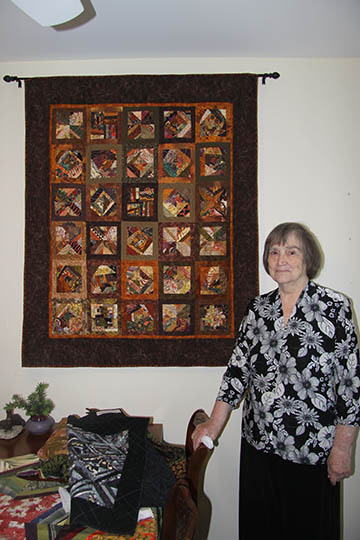 Mrs. Adkison loves string-pieced quilt and over the years has assembled quite a collection. "I've always liked to sew," she said. "I made my first dress when I was 8." "Every quilt I ever made just started with the question what if I do something silly," she said. "If you plan it too much you will ruin your quilt. It has to be spontaneous." String-piece quilting differs from the formal design common to most quilting, Mrs. Adkison explained. "You don't plan it out. It's such guilty fun. You just reach into your grab bag," she said. That spontaneity has prompted a modern return to string-pieced quilting. "You must be an artist. It's not like painting by numbers," she said. "I love the playfulness of string-piecing."